For no particular reason at all, I decided to roast a chicken and make creamy polenta. These are two things I’ve never made before – as they are daunting and a bit intimidating to make. But, I made an AMAZING dinner….Micah was happy. For the chicken, I turned to my favorite food site Tastespotting to find the perfect recipe. I landed on a Lemon & Herb Roasted Chicken recipe – easy to prep, easy to cook, and an oh so delicious result. In addition to the delicious roast vegetables that cooked in tandem with the chicken, I also made some polenta. Mainly because I just watched an episode of America’s Test Kitchen and they had made creamy polenta – and what do you know, I had polenta in my cupboard. It too is easy to make. But, if you want that recipe, go to their site and sign up (it’s free). They only share for free the recipes from the current season of episodes airing. Boooo. It’s no secret…I love Singapore. It was Micah and my favorite place we traveled to during our year abroad. A main driver of that love for this country/state/republic was the absolutely AMAZING food! And as you well know, one thing we love…is AMAZING food! Ah…a match made in Southeast Asian heaven. A couple of weeks ago we hosted a Singapore food night. The premise was quite easy. Make or buy food that you’d find in Singapore – and we eat it! Our friends Jodie and Kai (who we stayed with when we visited Singapore but also now live in Seattle), had the knowledge since they had lived there for a year. But while there are some distinct Singapore dishes, anything Thai, Chinese, Indian, Malay, Indonesian (sorry if I left someone out), qualifies as Singaporean. I decided to tackle what might be considered the dish of Singapore. Chicken rice. In Singapore, this seemingly blah-looking dish was the epitome of unpretentious awesomeness. I knew I wouldn’t be able to reach that same level of flavor – but I certainly tried. Meet my organic chicken. The first organic meat I’ve ever bought. Apparently it’s CRITICAL for the dish to get a very good, fresh-tasting chicken. I took this pricey little chicken and followed this recipe as closely as I could. The cooked chicken with homemade chili dipping sauce. And the aromatic flavorful jasmine rice. And there you go…chicken rice. Micah grilling it up. The satay was super tasty! Jodie and Kai made chili prawns – which were awesome. In Singapore we ate chili crab…and it was such an incredible dish…and messy too. Eat the prawns, and then use the steamed buns to wipe up the spicy sauce. Yum! Our other friends opted for the less mess version of cooking…that is, buying from a restaurant. But we weren’t complaining. Our kitchen counters were overflowing with thai basil salad, noodles, fried pork – all delicious! Lastly, can’t have a Singapore food night without a dessert! We opted for a classic dessert found in street carts all over Singapore. An ice cream sandwich…literally. In Singapore they use a rainbow-colored sweet bread, but we looked all over and couldn’t find anything like it. But white bread worked just fine. We had such a fun time eating and reliving/sharing some Singapore memories. We even got Tiger and Chang beer! And no group outing to our house is complete without some Catan action! Now…which country should we do next? So there’s a bit of confusion in the cookie world around what is America’s favorite cookie. In terms of total sales $ – Oreo is the #1 selling cookie. 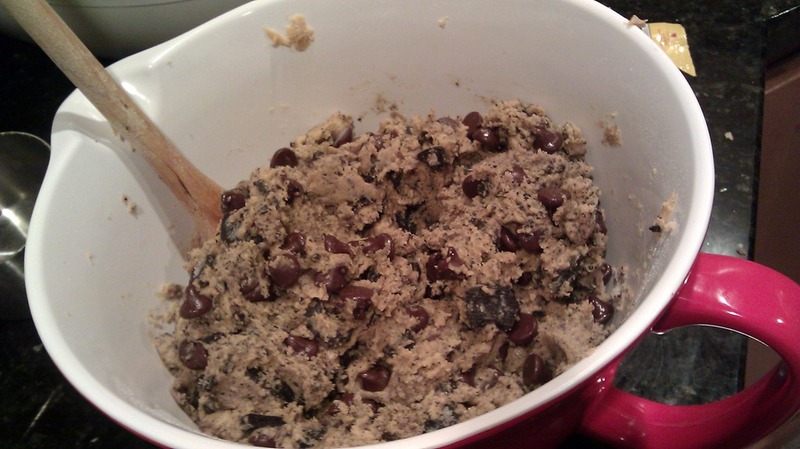 But in terms of actual cookie preference – well, of course it’s chocolate chip!!! I can’t claim invention of this idea – the credit belongs to this blog. But I can claim that I did just make these last night – in preparation for a road trip we’ll be taking this weekend. Back to the cookie. It really is just a chocolate chip cookie with crushed up Oreo bits. Easy. Anyone can do that. Ah-ha…but you didn’t!!! But now you can. The dough itself is quite yummy to eat (yes, raw eggs – but they were super super fresh). And the resulting baked cookie is just as delicious too! Can you see the yummy Oreo bits!!? Back to the roadtrip. Micah and I – along with a bunch of other friends are heading up to Vancouver – as in Canada Vancouver. We are just going for fun to hang out and eat lots of delicious food. Vancouver is considered the “Hong Kong” of the North. We haven’t been to Canada in years…so this will be a quick, but fun trip…fueled by these delicious identity-crisis cookies! Micah’s big 31st birthday was last week. Unfortunately, I’ve been so busy with work and wedding stuff that I didn’t really do much to celebrate on the actual day of. Instead, we celebrated with a big gathering of our friends over the weekend. We did exactly what Micah wanted to do: BBQ, eat, drink, chill, and play games. Of course, as part of typical Lisa protocol – I made a dessert! And this one was seriously AWESOME! (And so easy to make). If you knew who she is, then you might be familiar with this dessert already. If you don’t know who she is – just know she’s a very popular Southern cook, who’s number one ingredient in 99% of every one of her recipes is…butter! I’ve been wanting to make this dessert for quite some time, and I’m so glad I did. I thought there’d be leftovers for Micah to bring in to work for his co-workers…but nope, all gone! 1/2 cup (1 stick) butter, melted – I accidentally forgot this stick of butter – but it was still tasty…and honestly, probably better w/out all the extra grease. I wouldn’t include it. Preheat oven to 350 degrees. Lightly grease a 13x9x2-inch baking pan. If you search on the Internet – there are TONS of variations to this cake. And I’m sure they are all tasty! Micah and I exchanged stockings last night (remember the oh so cute ones we made for each other?) Mine was filled with lots of goodies, but mostly…candy. Despite my attempts pleas to not give me sugary treats this year (ahem…I do need to squeeze myself into a wedding dress in less than 2 months from now), Micah knew I’d still appreciate some sugary Christmasy goodness. And he was right. It’s been a test of willpower to not hoard my candy stash for breakfast! Despite my best attempts to curtail my sugar indulgences, I stumbled upon this the other day at the grocery store. Have you heard of such a thing? I had to buy…and I did. It was quite tasty! It makes me wonder if M&Ms is going the way of the Kit Kat and trying to break out into more interesting flavor combos. In addition to their standard flavors: plain, peanut, almond, and peanut butter, I have also seen/tried: coconut, orange, the strawberry one pictured above, and they even have cordial cherry. But my allegiance remains with Kit Kat. Chunky Twix Cookies!!! Click here for the recipe. It’s basically a choc chip cookie dough, but replace choc chips with chopped up Twix bars. It’s really easy to make, bake, and EAT! My stash of Twix bars! I suggest buying 5 packs…that’s enough for the recipe, with maybe one single stick for yourself. You know…quality control.